Hi Everyone! Leah here with another helpful Tip Blog from Eureka Crystal Beads! If you’re like me, you’re always looking for ways to nicely finish off your pieces. Truly, it’s not enough to have a beautiful front to something, because the details of the back are also important! Often times we look at the front, ohh and ahh, and flip it over to see the backside. Or, ooogle at how lovely the necklace is and then check out what sort of clasp it has. It’s in our nature to want to know how things are created and constructed, so we flip over and slide around to see all aspects of a bracelet, necklace, etc. Today, I’m going to tell you a little more about Wire Guards! Here at Eureka, we carry Sterling Silver Wire Guards as well as Gold Plated Wire Guards to hopefully meet all your needs. If you’ve never used Wire Guards, read on to learn more about these lovely little findings that truly finish off your clasp area visually in addition to making it strong for longer lasting designs! First, let’s take a look at what a Wire Guard looks like. I’ve included 2 different views for you. Essentially, you have 2 tubes that are connected by a half-tube bridge. This finding will slide through the loop of your clasp and your clasp loop will sit at the center of the bridge, which is where your beading wire will also sit, along the other side. In this next image, you can see how I’m looking to use one of the Wire Guards at the end of a bracelet I’ve strung on some Soft Flex Beading Wire with Swarovski Crystal Beads and a small Sterling Silver Tube Crimp near the end right before the last Swarovski Crystal. You’ll notice that I’ve now threaded the Wire Guard through the loop of my Ball and Socket Clasp that I’ve chosen to use. I’ve now taken my Soft Flex and threaded it through and along the channel provided by the Wire Guard. Lastly, I’ve threaded it back down through my 4mm Swarovski Crystal Bicone and then the Crimp Bead. In this final picture you’ll see how I pulled my Soft Flex nice and tight (after it was threaded through the crimp bead and the bicone right after it). *I used my Crimper Tool to crimp my crimp bead and my bracelet is all finished! You can see how now only is the area where my Soft Flex loops through my clasp nice and clean, but it’s also PROTECTED from rubbing and wear/tear because of the Wire Guard channel bridge! It’s a Win-Win in my book! 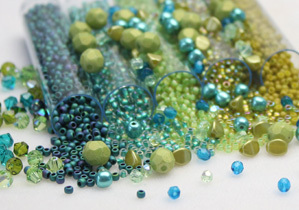 Previous Post When does (bead) size really matter?? Next Post Birthstone Breakdown: Everything you need to know!